After I put the previous problem child to bed, I was confronted with his fraternal twin. This one is a scrappy floral beauty with a pink tone-on-tone fabric and brown setting triangles in the same streak of lightning layout. It’s the fraternal twin to the scrappy plaid quilt because it came about when I originally miscut all the setting triangles for that quilt. 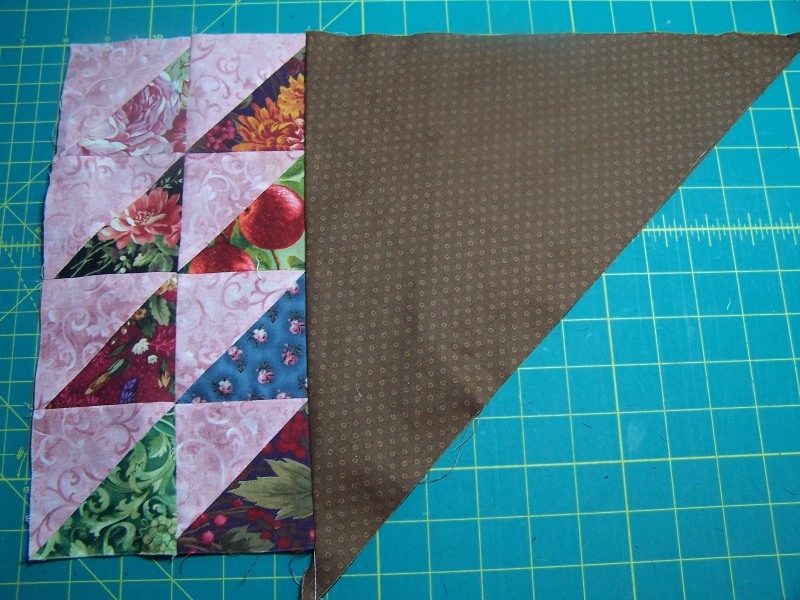 Not wanting all those setting triangles to go to waste, I decided to make smaller HST units so I could use them in a quilt with the same setting. One of the other maddening things about unbagging long-standing projects is trying to figure out just where you were in the quilt-making process. Unless you have a very good memory [not me! ], you waste time figuring out what’s been done and what still needs to be done. Are all the blocks made? Is all the fabric I need here? Did I make all the flying geese units I need for the border? And on and on. Because the first strip is sewn for this version of the streak of lightning quilt, I am assuming I must have all the HST units made that I need. However, I was also confronted with a number of these units when I unbagged this quilt. Huh. At first I had no clue why I was sewing the units together like this—some have the HST units on the right side of the setting triangle and some have them on the left side. I have the perfect solution to this “figuring-it-all-out” problem but some of my long-standing projects aren’t included in this perfect solution. [I need to remedy that!] 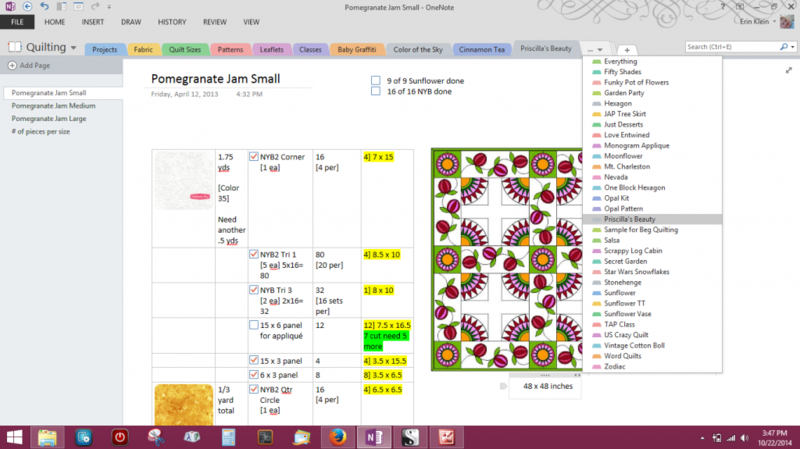 This is a screenshot of a Microsoft program called OneNote. 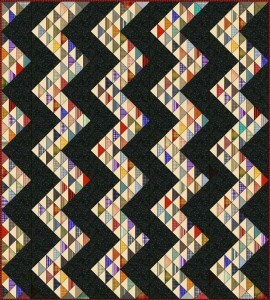 When I have an idea for a quilt that I might want to make, I create a new section in my Quilting notebook for it. I usually add the EQ7 drawing and maybe some fabric swatches or a color chart. I might figure out the yardage needed and if the design is Inklingo-able, I might create a cheat sheet with the number and sizes I need to cut the fabric for printing. 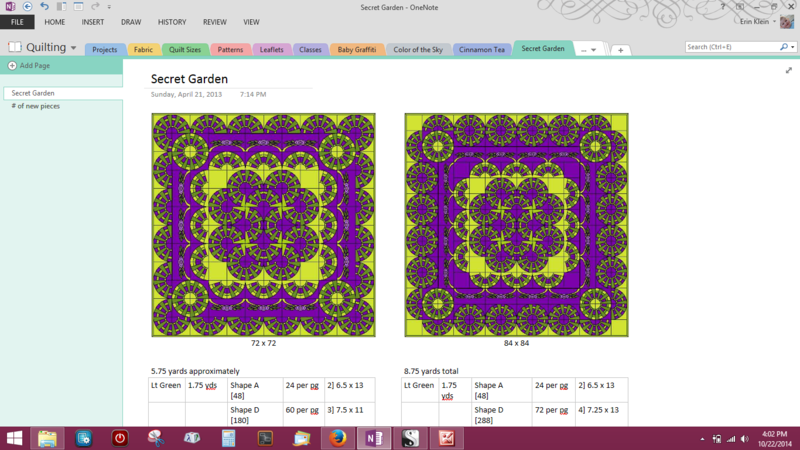 This is a screenshot of my ideas for making my Case of the Secret Garden quilt larger with a border of applique and more New York Wheel blocks. One last selling point for OneNote… There’s an app for my phone so I can access my Quilting notebook while at the quilt shop when I discover that perfect backing fabric but have no idea how much I need. That information is listed in the section called, Projects on a page for finished projects that are waiting to be quilted. Cool, huh? Okay, back to my scrappy floral streak of lightning quilt top… After slapping those sections up on the design wall over the scrappy plaid strips, I found out I had come up with a way to sew two strips together at the same time and thereby eliminating the need to sew four of the long seams in the final quilt top assembly. [It’s a shame my brain won’t let me remember such brilliance when I first see it.] It would have taken me a lot longer to figure this out if I hadn’t already had the scrappy plaid quilt on the design wall. It would have taken a lot less time to figure this out if I’d had a section in my Quilting notebook for this quilt explaining my brilliant sewing plan. 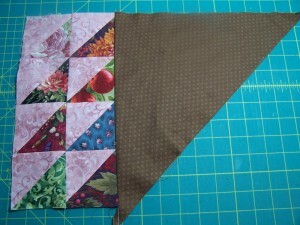 I’m hoping to have this top together late tonight or sometime tomorrow at the latest. Two projects down, three more to go. Maybe you are a “good” quilter/crafter and only work on one or two projects at a time until you see them through to the end before you begin another. Me? Not so much. Not that I’m going to label myself a “bad” quilter or ADD because of my long, long list of quilting projects. 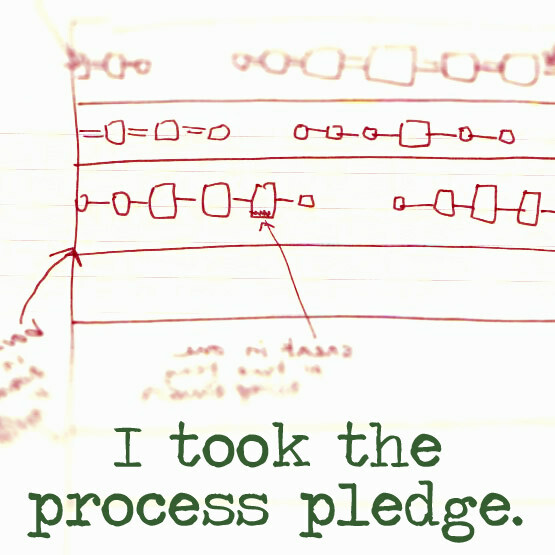 [I do try to limit the number to no more than two dozen ongoing projects. LOL] The “thing” for me [and I haven’t come up with a name for this “thing”] is that I thoroughly enjoy the excitement of beginning a new project more so than the thrill of finishing it. Add to that my complete lack of guilt over my unfinished projects and maybe you can see why I’m up to 22 projects. You know how when you get back to a UFO long-standing project that’s been languishing in a bag at the bottom of a pile clear plastic project container in a closet in your sewing room, there’s always that surprising moment when you remember exactly WHY this project became a UFO? I hate those moments. 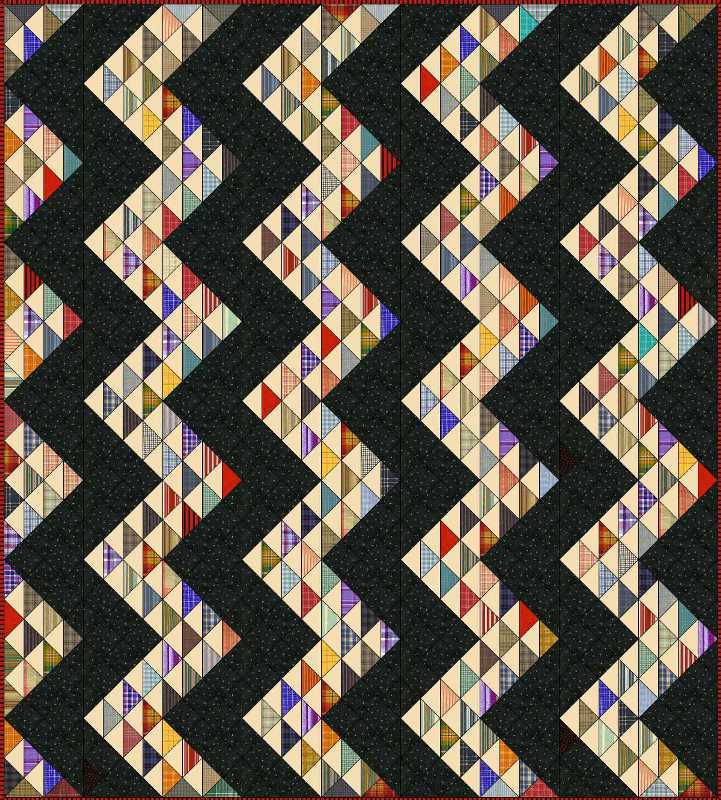 This is an EQ rendition of the scrappy plaid quilt that I started who knows when. When I dragged this project out of the armoire where my UFOs long-standing projects [LSPs?] are stored, I couldn’t figure out why I hadn’t finished sewing the quilt top together. [In case you are wondering, I’m resisting using “UFOs” because of the comment spam I get about UFOs—the kind spotted in the night sky—whenever I post something about unfinished projects. I think because I live so close to Area 51, I get double the spam. And I’m sure I just upped the ante with the Area 51 mention…] I pulled out nine completed strips from the project bag—six folded together and the remaining three folded together. This fact didn’t jog anything in my conscious memory. It should have. I spent part of the day listening to a Harry Potter audiobook while unsewing and resewing part of this project. That jogged a vague memory of the last time I worked on this quilt. I was housesitting for a couple that likes to go to Mardi Gras every year. 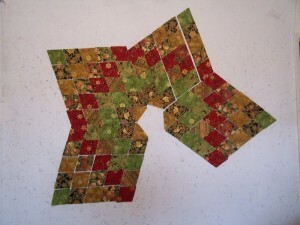 Another quilter, but her design wall wasn’t big enough to pin up the strips. I started sewing the strips together anyway and noticed something was off so I laid them all out on a bed and discovered my errors. At the time, I unsewed the strips I had sewn together but didn’t want to take the time to fix the three bad strips I discovered. I carefully folded everything up—six strips in one pile and the three bad strips in another—with no note as to why I was folding the strips in that way—potentially compounding my erroneous ways. My subconscious memory was looking out for me though. This time I decided to put the strips up on the design wall even though it’s currently covered with the homeowner’s four ongoing projects. That was when I discovered rediscovered there was an issue with three of the strips. Now the strips are resewn and waiting to be ironed. I can put this top together and add it to the “to be quilted” pile. One project down, four more to go. I decided to work on some long neglected machine piecing projects while I have access to a sewing machine. 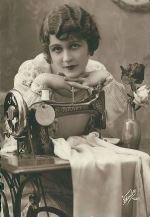 It has been more than 3 years since my favorite sewing machine was killed [It took a header down a flight of stairs and never recovered. It was a sad, sad day. I still mourn its loss…] and I have not been able to replace it. These machine piecing projects have been hanging around far too long. It was taken at a third house. I can tell by the design wall. [Yes, I house sit mainly for other quilters and some are kind enough to let me use their machines since I’ve been without one for so long.] I think I finished up that first diamond. Unfortunately I can’t find that diamond. It’s not in the project bag with the rest of the shapes. I really have no idea where it could be except somewhere in storage. Also missing is a shoebox with approximately 125 unfinished .75 inch hexagon flowers. The shoebox also contains all the half and house hexagons shapes to make the quilt square and about 250 finished hexagons flowers. And 3 months of a twelve-month BOM is missing as well. I really thought I was so careful to keep everything together when I sorted, packed, unpacked, and had the movers arrange the storage unit. Not so.